Batik as the traditional fabric with distinctive patterns and colors is probably the first thing that comes to mind when one talks about Yogyakarta souvenirs. Today, batik patterns are easily found on various products, such as hats, bags, keychains and even shoes. Another appealing handicraft is wooden batik. As the name suggests, it is a wooden plate painted with a batik pattern. I found this interesting place after I asked my friend to take me to an ussual place around Yogyakarta. So he offered me an experience to see a place of wooden batik process. We went to Krebet hamlet, Sendangsari village, Pajangan district, Bantul regency in Yogyakarta. 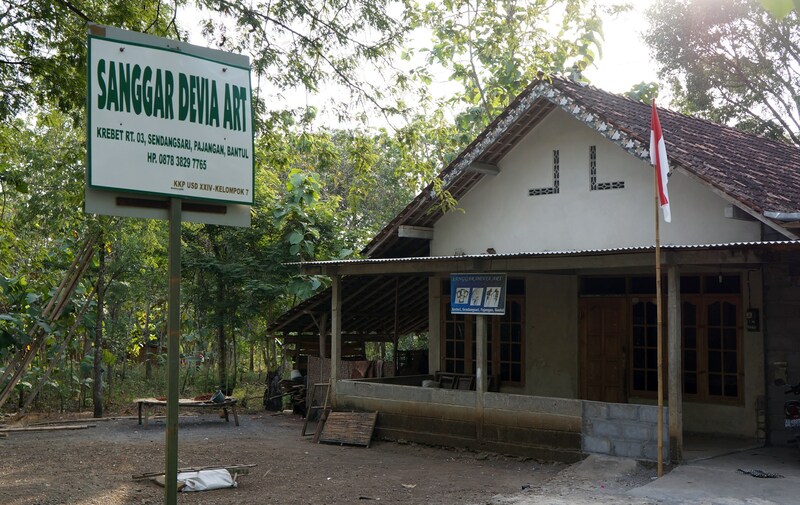 There is the home of a renowned wooden batik center. A quintessential piece of the hamlet’s cultural identity, wooden batik has now become the financial backbone of most of its people. It took a one-hour drive by motorcycle to reach the hamlet from downtown Yogyakarta, and luckily, it’s not that hard to find. Drive to Jl. Bantul in southern Yogyakarta. Turn right after spotting the Masjid Agung Bantul (Bantul Grand Mosque). The Krebet hamlet is located near the Sindon Bridge. Once you enter the gate of Krebet, it is looked like an ordinary village. But then you will see several wooden batik workshops. There are also workshops in which tourists can paint their own wooden batik, though they might find that it’s harder than it looks. According to one of the craftsmen, most of the villagers used to only craft masks. As time went by, they had to get creative. Thay though that painting batik patterns on the wood could make unique handicrafts. Today’s craftsmen put the batik motif on various items such as bangle bracelets, necklaces, animal miniatures, keychains and other things. Come and visit the hamlet in the morning. The craftsmen are about starting their work at 9.00 am. The production process starts with using a canting (a pen-like tool used to draw the batik pattern in wax) to make patterns on a piece of wood, usually mahogany or other soft woods. Then, the wood is colored, cleaned and air-dried. Most of the products are marketed to outside cities. Some are even exported to foreign countries through distributors. Many of the souvenirs are available at affordable prices. For example, at Ragil Handicraft, I can find a wayang puppet key chain for only Rp 4,500 (50 US cents). Other souvenirs, such as wooden masks, might cost up to Rp 600,000 ($54.60). This entry was posted on September 4, 2013 by Edna Tarigan in About, Indonesia, People and Culture, Travel, Yogyakarta and tagged Batik, culture, Indonesia, mask, people, wood, yogyakarta.